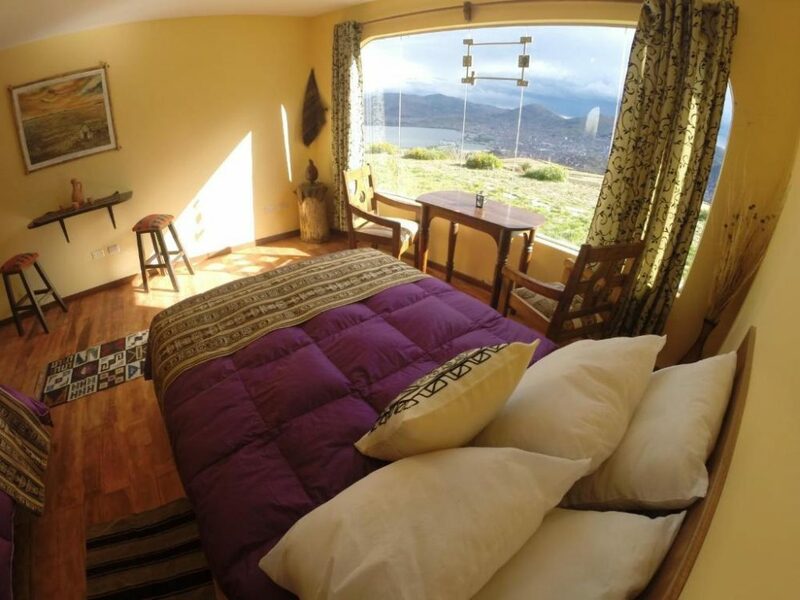 If you’re looking for luxury accommodation around Puno, Titilaka is a fantastic choice. Located on a remote private peninsula, this all-inclusive resort is well off the beaten path and has only eighteen rooms so you’re guaranteed peace and quiet. Don’t worry about the distance to Puno (an hour drive) because meals, drinks, and excursions are already included in the price so you’re all set. The trips cover the islands as well as the sights on the shore, and there’s even an option to travel to the Bolivian side. The rooms in Titilaka have a sleek modern design with a signature Peruvian touch – the colourful carpets, wall hangings and pillow cases are authentic local crafts from the region. And, of course, there is the view. 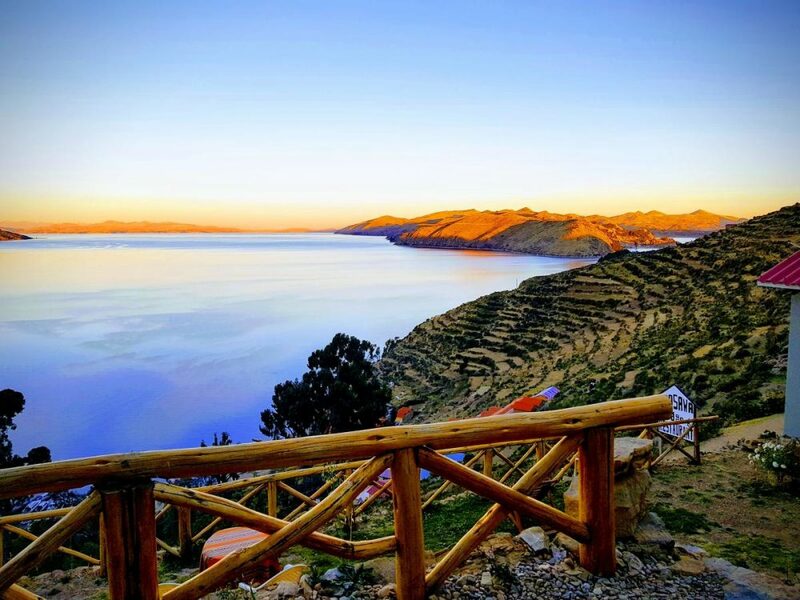 What more can you ask for than waking up to the shimmering Titicaca lake every morning? Mirador del Titikaka might not be an exclusive resort but the views are definitely 5-star. 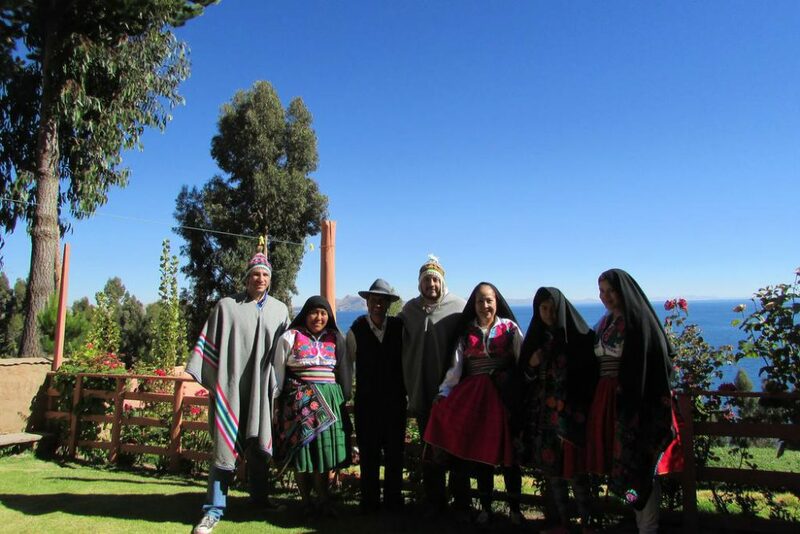 The hotel is located on a hilltop with panoramic views of Lake Titicaca, mountains, and the city (which looks especially picturesque at night). Despite being just 10 minutes’ drive away from Puno, Mirador is set in a quiet and secluded spot so don’t worry about getting a good night’s sleep. Although the rooms are admittedly quite simple, the amazing views, warm welcome, and affordable prices make this hotel one of the most popular choices in Puno. Extra perks? The property has its own hiking trail that takes you past ancient tombs and herds of alpacas grazing on the grass. 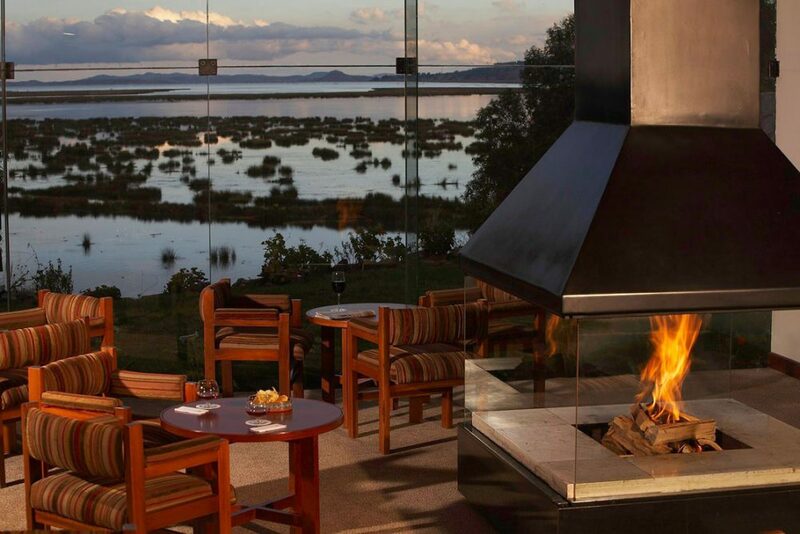 If you want a high-quality hotel experience, 5-star Libertador Lago Titicaca is one of the favourites in the area. They’ve got you covered for the post-sightseeing chill session – the hotel features spa with a sauna, a small gym, and an in-house restaurant. But the real highlight here is definitely the location. Libertador is set on a small island just off Puno (connected to the mainland by a road so you can still get a taxi) which gives it the most stunning front-row views on the lake. The rooms are divided into sunset and sunrise options so there’s something for everyone and all of them feature huge windows. Whatever you say about Huaytusive, it’s an absolute steal. The furniture might have seen better days and the interior style is antiquated, but for a comfortable double room with breakfast (and a good one at that!) this is a bargain. The hotel is right in the centre so it’s easy to get to and handy if you’re planning daytrips. Comfortable bed, a breakfast buffet and a private bathroom with hot shower? Yes, that’s still possible on a shoestring budget. Puma Hostel is not going to blow you away but it won’t break the bank, either. The hostel is located in the centre of Puno which makes it a great base for daytrips, but get your earplugs ready because it can be pretty noisy from the road. Basic knowledge of Spanish can also come in handy here since not all members of staff speak English. If originality is something you look for in your hotel, then Hostal Las Olas Guesthouse is an undeniable winner in Copacabana. 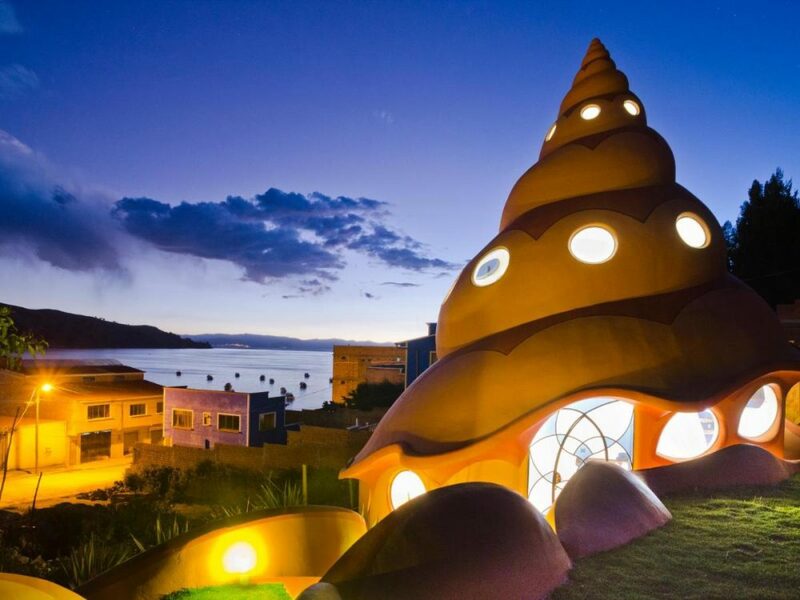 The complex consists of ten private villas, all of which are unique and come in different shapes (seashell house, anyone?). Think of a Gaudi-esque extravaganza of colours and forms and you pretty much have Las Olas. The houses were built using mainly natural materials from the area and the hotel takes sustainability very seriously so no guilty conscience here. With your own kitchen, fireplace and a garden, it would be a shame to only stay here for a night. Hostal Las Olas is definitely a great choice for a longer stop so you can fully take advantage of the private terrace and chill in the hammock with lake views right ahead of you. The Romantic One – Hotel La Cupola Hotel La Cupola is well-located for two reasons: it’s close to the main attractions of Copacabana and it has an insane view. 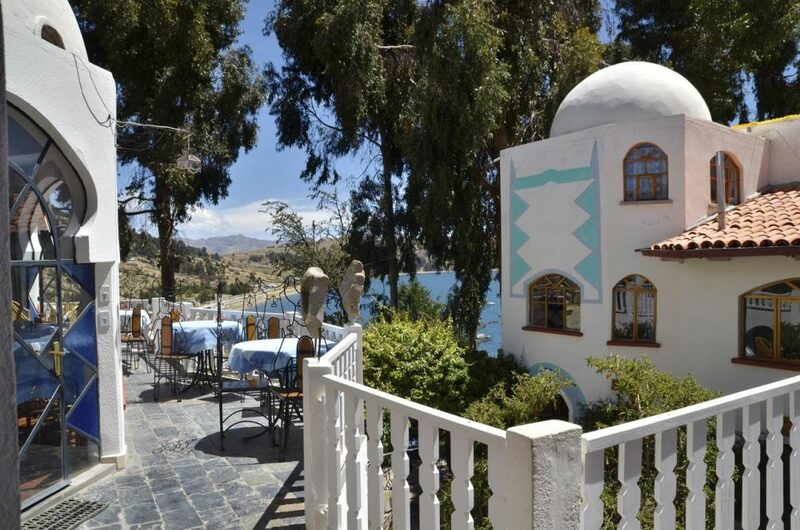 Situated on a hill, it offers sweeping views of Lake Titicaca, the beach, and the city. Depending on your room choice, you might even be able to enjoy these vistas right from your private patio (worth it!). While being in the mid-range category, this hotel certainly has a lot of flair. The whitewashed walls, wooden furniture and blue stained glass make for a very romantic and nostalgic combination. You can easily spend an entire afternoon here relaxing in a hammock and taking in Copacabana views. 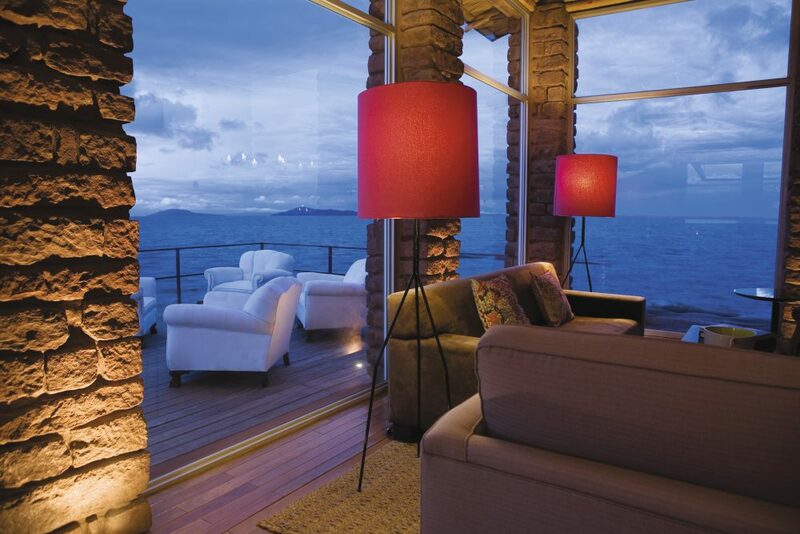 If you want a resort holiday break in your itinerary, Hotel Rosario Lago Titicaca will get you covered. Located 2 minutes away from the beach, it has spectacular views of the lake that you can admire from your own balcony. Luckily, all rooms face Lake Titicaca so there’s no bad choices here. The interiors at Hotel Rosario are spacious and modern but have a Bolivian twist – if you’re a fan of local arts and crafts, you’ll really enjoy the décor here. And importantly, there’s everything here to spoil you after a long time travelling, including gorgeous bathrooms with walk-in showers, abundance of pillows and free toiletries (time to stock up for the rest of the road!). Hostal Florencia is a popular choice with backpackers in Copacabana and it’s easy to see why. For just $20 you can get a double bedroom with breakfast and a private balcony (with a nice lake view if you’re lucky). 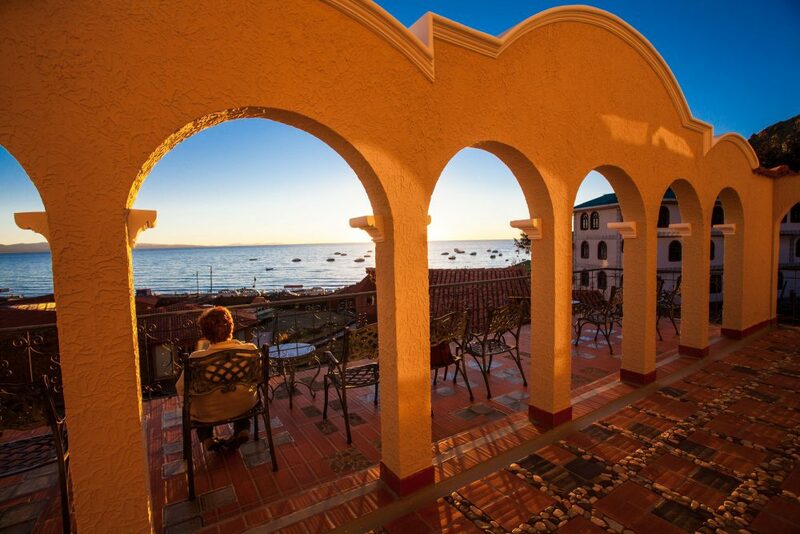 Even if you’re not one of the fortunate ones who have Lake Titicaca right outside their window, you can always go up to the rooftop terrace and enjoy a lovely panorama from there. The hostel is located right next to the Basilica and only a 5 minute walk away from the bus terminal which makes it great for exploring the city on a tight schedule. If you want 5-star views for a mid-range price tag, Utasawa Lodge is the one. This family-run B&B is one of those where you get a warm welcome right from the start. 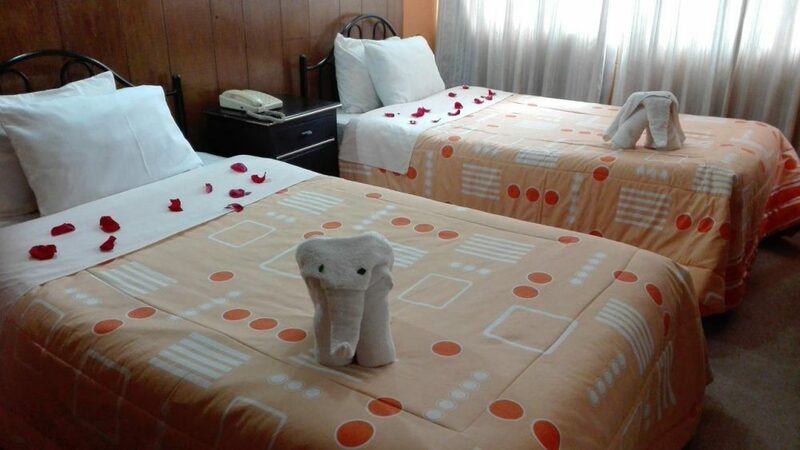 The rooms are nothing fancy, but they’re very cozy and you can count on hot shower, wifi and soft pillows. Plus, the breakfast spread is really generous! Every room has a an east-facing lake view so if you’re an early bird you can watch the sunrise directly from your bed. 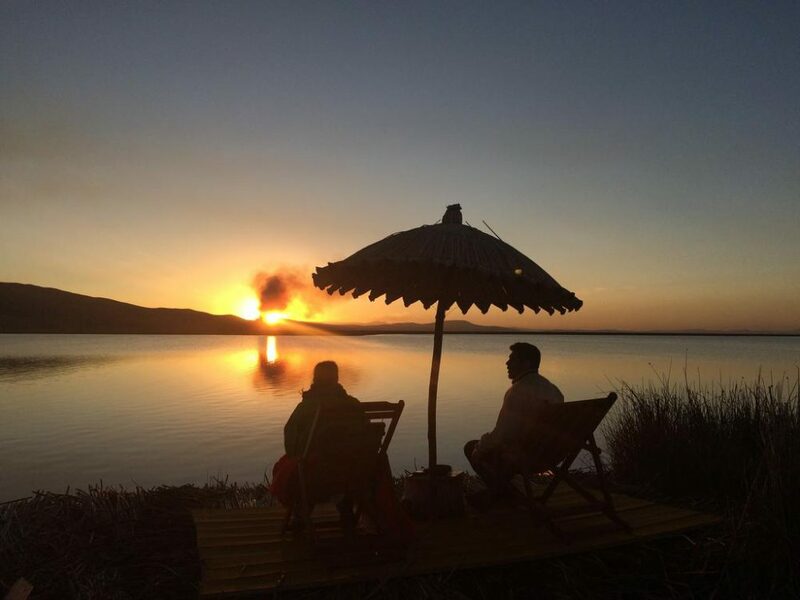 Chaska Wasi Amantani Lodge is a cozy family-run hotel where you’re not just an anonymous guest. 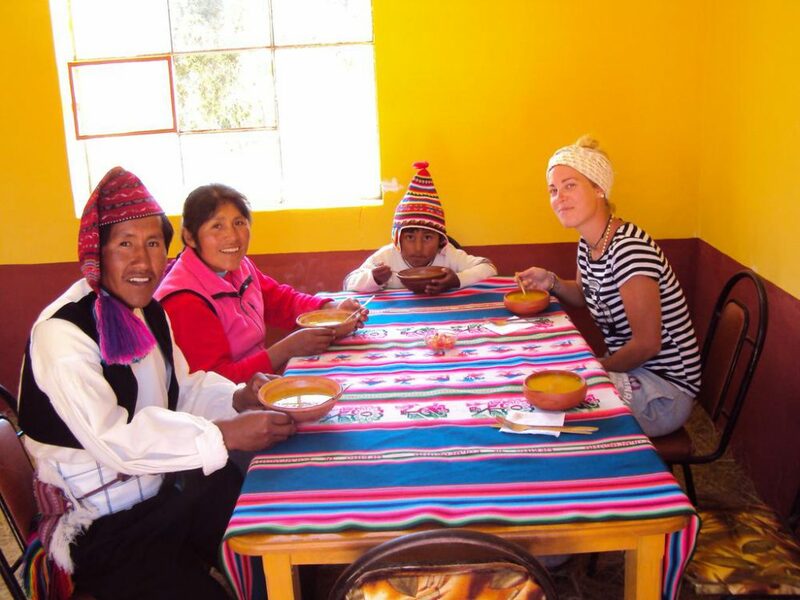 The hostess will cook tasty Peruvian treats for you and the host will tell you about the history and customs of the Amantani community. If you’re lucky, they might even take you to a local fiesta for some well-deserved dancing! It’s probably a good idea to brush up on your Spanish before the arrival as the hosts speak limited English. The only way to experience Taquile without tourists is to stay overnight and enjoy it once all the boats have left. If you want to get to know the local community and their way of life, Familia Celso Inn is a great start. You’ll have meals with the family, you’ll listen to countless island stories and you’ll get insider tips on what to see. The rooms are pretty basic but clean and comfy, and there’s hot shower. Prepare for a total isolation from the outside world – there’s no wifi at this homestay and your data will likely not work (you can treat it as a free digital detox). Now here’s the real treat! 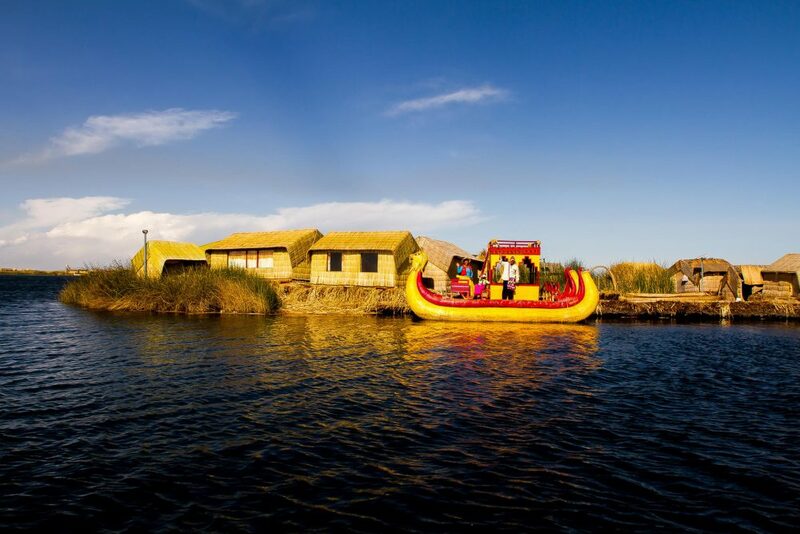 Uros Titicaca Lodge is built on a tiny floating island constructed of wood and totora, a plant common to the area. That means that the lodge has 360 degree views of the lake and the surrounding floating islands! And they make good use of them too with hammocks, sun beds, and even a watch tower. The rooms are kept in the spirit of a traditional Peruvian home with colourful throws on the beds and beautiful hand-woven wall hangings. There’s also plenty of authentic Peruvian activities to enjoy. Included in the price there’s cruising in totora boats, kayaking, and a visit to the Uros community where you can learn local handcrafts. Of course, staying on a miniature island means that you’re pretty much stuck, but all meals are included and the hosts will make sure there’s not a dull moment during your visit. 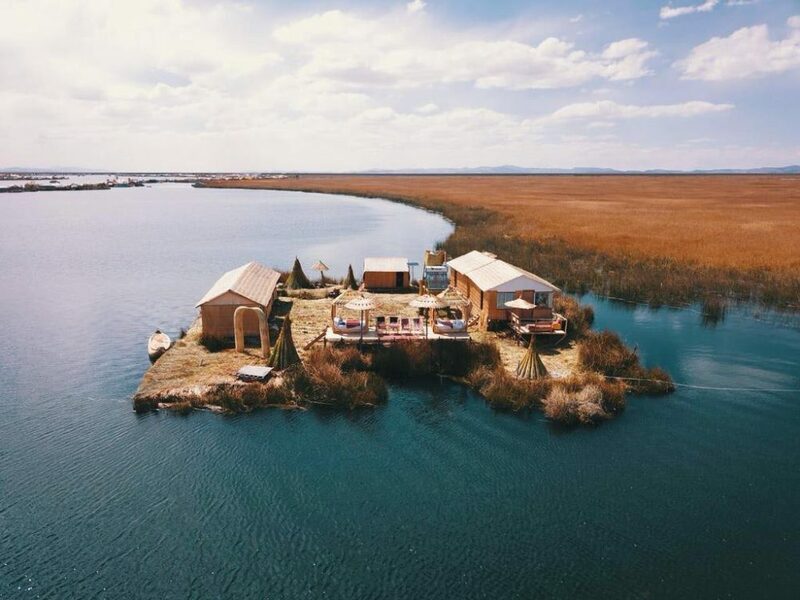 Nothing to cut yourself off from the entire world like staying on a floating island, right? At Uros Samaraña Uta Lodge, there’s no wifi, no TVs and no heating (don’t worry, you’ll be provided with a ton of blankets and hot water bottles). All you can do there is enjoy the lake views, immerse yourself in the local culture and maybe take a nap or two in a hammock under the stars. Like most other Uros island stays, this one is all-inclusive: the transport from Puno and back, all meals, and daily activities are included in the price. So all you’ve got to do is sit back and relax. Easy. If luxury is calling your name, it’s got to be Amalia Titicaca Lodge. Set on a lovely floating island a little bit off from the usual tourist routes, this lodge offers peace and quiet throughout the day. Despite being called a “king room”, your accommodation is actually a private house with an outdoor dining terrace and huge windows to admire the lake. There are only two houses for guests which makes the experience even more special. Both are spacious, cozy and proper fancy – it’s almost mind-blowing that you can get such nice bathrooms on a reed island! Your stay includes a guided boat tour with the host exploring the area and learning about the local ways of life as well as a sumptuous breakfast cooked by the hostess.